The house listed, we took off with good friends, Ginny and Ken, in early September for Seattle and then on to Alaska for a trial run… What an amazing time we had! While in Seattle we stayed with my sister in her beautiful home that hangs over the edge of Puget Sound with a spectacular view of the Olympic Mountains, and we did the “must see” sights of the city: Pike Place Market, the Locks, etc. From Seattle we flew to Anchorage and drove up the Parks Highway to Denali. We stayed in a little place in Healy, not far from the park. The Inn was clean and well-furnished but the stay was a bit odd. We never saw anyone “in charge” from the time we arrived in the late afternoon through the time we left the next morning. We missed the small sign near the Inn the first time through but when I called, a pleasant woman directed us back to the entrance. When we did arrive, there was a sign requesting we remove our shoes, and a large shoe caddy inside the front door but try as we might, we could find no person to inquire about our room. So once again I called. The same woman explained the room assignments were posted on the deck by the entrance and keys were in the room, but if we had difficulties she could come down. A continental breakfast had been put in each of our two rooms for the next morning, and except for the fact that while making toast I set off the fire alarms in ALL of the approximate 8 rooms, and the hard boiled eggs had expiration dates two weeks prior, the night was uneventful. Beds were comfortable, rooms were clean, there were refrigerators to keep our beer cold and the rooms were spacious enough for our euchre game! We were particularly grateful that Mt. McKinley, in Denali National Park, was out in full splendor. The Alaska wildlife was amazing: we saw moose, Dall sheep, mountain goats, Stellar Seals, sea otters, even a black bear wandering near our cabin in Glenallen. But for me the most amazing part of the trip was the two days we spent in Nome with a side trip to Tellar. This was the Alaska I had envisioned! Anchorage and Fairbanks could be cities in the lower 48. The Kenai Peninsula was nice but there was a lot of development. We had decided to visit Nome because our youngest son, Patrick, is working there for six months on a political campaign. Nome is a small community of about 3,000 just south of the Arctic Circle and about 100 miles east of Russia. We stayed at a place called the Nugget Inn (and by the looks of it, it could have been there during the gold rush)! But that quirkiness fit the town. Our room faced the Bering Sea and we went to sleep at night listening to its surf. Nome is the end point for the Iditarod and besides dogsled you can only get there by plane or boat. It’s an expensive place to live given that everything has to be flown in or transported by barge. (The last barge of the season came the week after we left and there wouldn’t be another until spring.) We flew from Anchorage to Nome in a 737. It was a full flight that we boarded and deboarded from the back of the plane because passenger section didn’t begin until row 16. The first half of the plane was walled off for cargo. We were particularly amazed by how friendly the folks of Nome were in particular, as well as the Alaskans in general. Alaska is made up of a lot of transplants from the lower forty-eight. Maybe that partially accounts for their friendliness. People are there because they choose to be. They aren’t the folks talking about what they’d like to do. They’re the people who actually took the risk and moved. Nome reminded me a little of Newfoundland, small colorful homes mostly on stilts because of the permafrost and relying a lot on the sea for its sustenance. It’s situated on the tundra with a long main street lined with bars whose name reflect their location: The Bering Sea Bar and Grill, The Polar Bar, The Polaris. 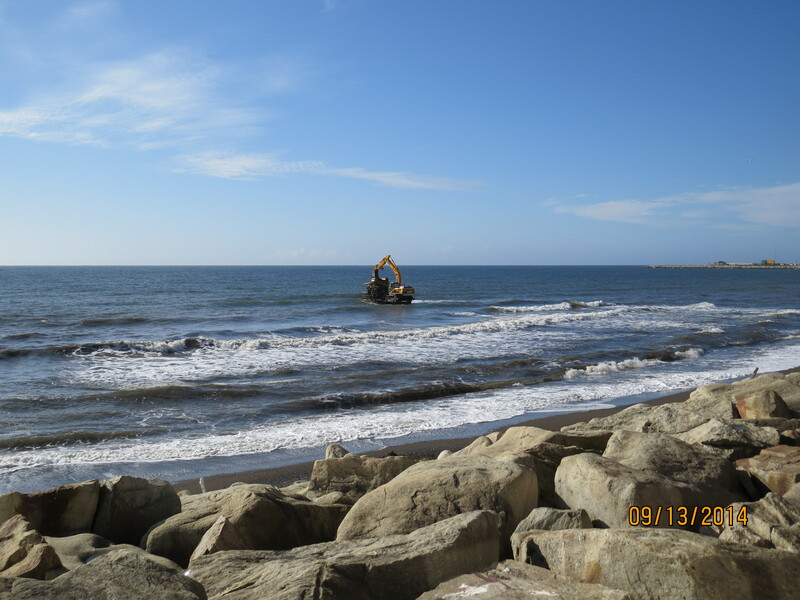 In the sea we saw a lot of dredgers; folks looking to find that big nugget. My son suggested we eat dinner at Pingos. Oh my! What a find! Pingos (named for the geological landform) Bakery and Seafood Restaurant. Here in the one of the most remote areas of the country was this wonderful gastronomical find! The small restaurant has four tables and seats about 16 people max. The staff appeared to consist of the chef/owner and one other wait staff. Three dinners were offered: a crab pizza, a beef skirt steak salad, and a halibut fillet. The four of us chose the Norton Sound Grilled Halibut fillet. Everything was homemade and the seafood all local! Needless to say, we headed back the next morning for breakfast. Homemade rolls! We came away with the conclusion that the chef never sleeps! I truly think the best food we had anywhere in the three weeks was at Pingos! On Sunday we traveled with our tour guide, Richard, to Teller. 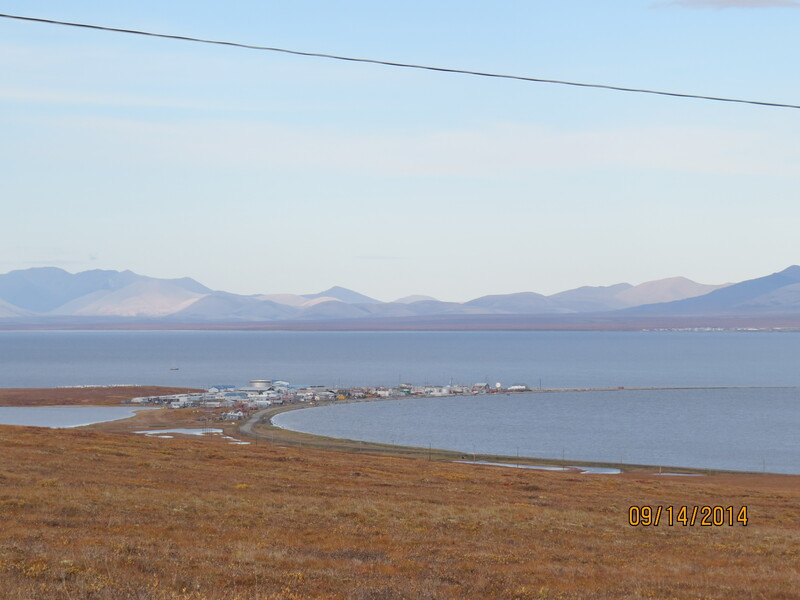 A small native community located at the end of one of the three roads out of Nome. 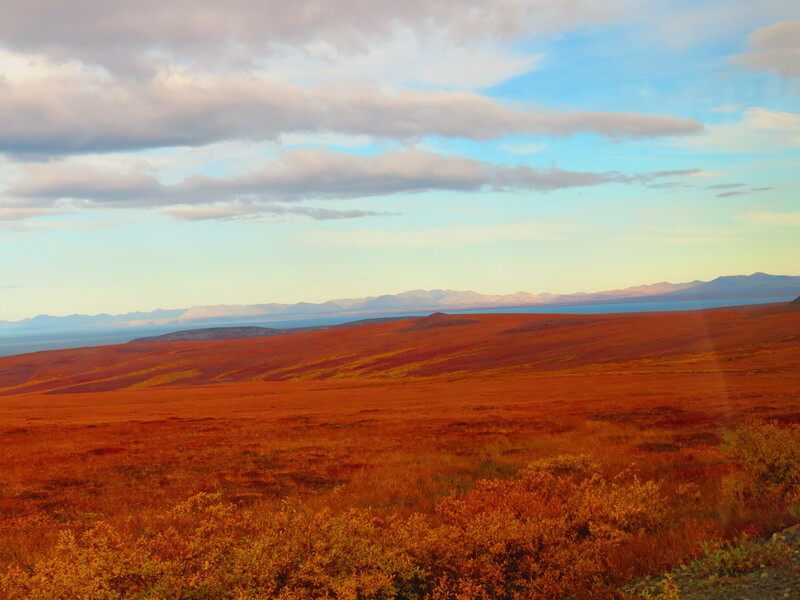 It was about a 70 mile drive across the tundra on the Teller Highway. Highway seems to be a misnomer. This one was unpaved. Richard, age 70, moved to Alaska some 35 years ago from New York City and provided us with interesting facts and local history along the way. The tundra seems unending and we were lucky enough to see a musk ox and also a small herd of reindeer atop a ridge on our trek. Richard also stopped near a small building explaining that behind it were some tall weeds that the woman could use. Luckily, Ginny, had thought ahead and brought some toilet paper. Obviously, things were easier for the men. Teller has a population, mostly native, of approximately 200 people. Ginny and I were immediately struck by the sounds of children laughing and playing outside. Richard had arranged for us to visit a friend, Sarah, an older Inupiaq woman in her home. We sat around her kitchen table and just chatted while we munched on the salmon spread and crackers she provided. She told us stories and we posed questions. There was nothing “canned” about this conversation. What an understated people the Inupiaq people are. The native Alaskans were nomadic, but then the government got involved and the way I understand it, the Bureau of Indian Affairs (BIA) decided to provide the people with schools which meant that they had to stay in one place and could no longer migrate with the animals. Sarah worries about whether Teller, which is located on a small spit of land, will flood again and they’ll have to evacuate this winter. But she worries in much the same way we would worry about whether rain will spoil our outdoor plans; however, flooding could cut Teller off from the rest of the world. Even in good weather, life isn’t easy for those in Teller. Sarah’s is a life of paradoxes. There is no indoor plumbing in Teller. Sarah has a honey bucket in her bathroom that she must empty. She is an accomplished quilter, but when asked where she got her materials, she told us she orders them off the internet. She loves Turner Classic Movies. But on the other hand, she dries her own fish and explained to us how important it is to be careful in order to avoid food poisoning. She also freezes fish for the winter. She thinks the musk oxen are magnificent animals but “not good neighbors” because of the damage they can do in the village. Richard stopped to visit with a man on a four wheeler as we were leaving the village. The young man combs the beaches and showed us what appeared to be a very old ivory carving. He was very proud of it and said he would soon list it on the internet. He shared a recent sale of another piece of ivory and although he didn’t say how much he sold it for, he said he got what he was hoping for it. We left feeling we had been really fortunate to have had a glimpse into what daily life must be like for the Inupiaq in these very small remote outposts. I can’t help but wonder what they must think of the daily news they read about and listen to on their computers. Hopefully, our future travels will provide us with more opportunities to share diverse cultures…knowing that this one will be tough to top! It’s parent teacher conferences tonight at Chippewa Hills and wanted Bob to know he is missed by all and the kids still ask about him. Glad you are having a wonderful time. 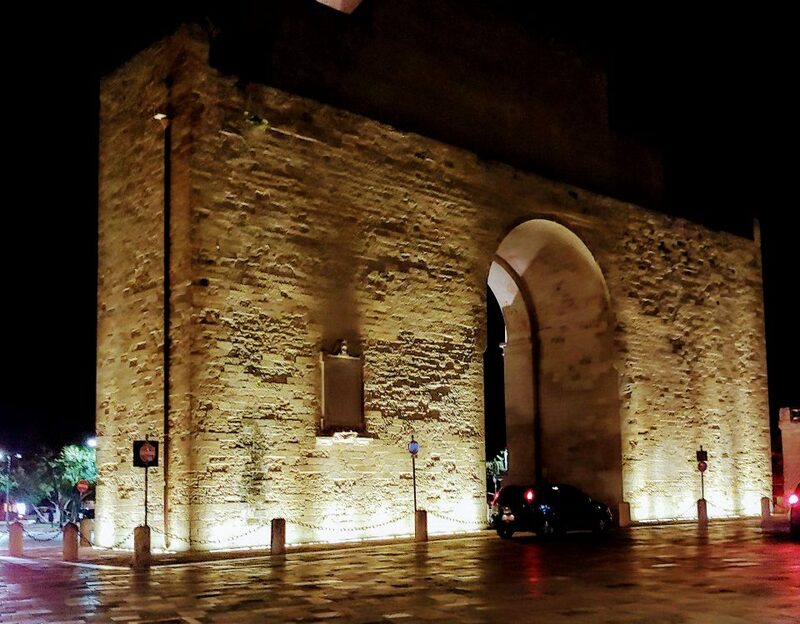 Thanks for sharing your adventures with us. It would be great to see you when you are back in town, maybe a guest speaker?